Human Aspects of Urban Form: Towards a Man-Environment Approach to Urban Form and Design examines the way people perceive the city, the effects of urban forms on people, and the role of images. By adopting a man-environment approach, this book seeks to understand the importance of cities for human behavior or satisfaction. This text also considers the way given urban configurations fit people's psychological, cultural, and social needs. 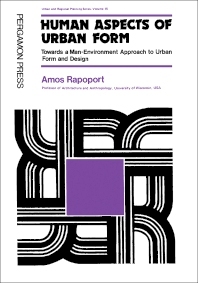 This book consists of six chapters and begins with an introduction to many of the concepts related to human dimensions of urban form and design. Urban design is discussed as the organization of space, time, meaning, and communication. The chapters that follow focus on the nature of the environment, cultural differences, role of values, and the concept of environmental perception as it is being used, along with the concept of image and schema. The three meanings of ""perception"" are then analyzed: the notion of environmental quality and preference as a variable concept and its constituent parts; various aspects of environmental cognition and its relation to design; and perception proper and its various aspects. Discussion then shifts to social, cultural, and ethological concepts that clarify the nature of urban space organization. This book concludes with a chapter stressing the need for people to get involved in the environment, the relationship of activity and form, and notion of open-ended design. This reference material will be of interest to students and practitioners of urban design and planning.